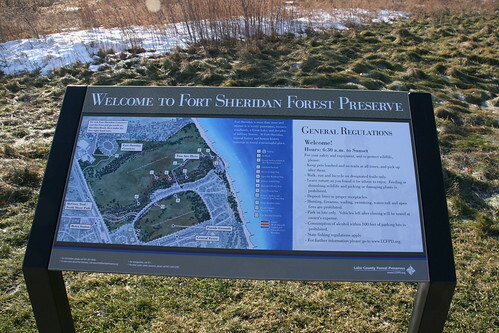 Today we visited Fort Sheridan Forest Preserve in Highland Park IL, just 20 minutes from here. The 250-acre preserve is located on the Lake Michigan shoreline at the site of the former Fort Sheridan army base. The area features rolling terrain, bluffs, ravines and trees set against the shoreline. There are a few scenic trails that wind through the preserve to the sandy shores of Lake Michigan, providing the first official public access to this section of shoreline since the Fort’s military operations began in 1887.